Is your vehicle safe from repossession when you file chapter 7 bankruptcy? What if you hadn’t completed your Chapter 13 and your car was repossessed? Are you able to get your vehicle back? Is your vehicle safe from repossession when you file chapter 7 bankruptcy? Are you able to get your vehicle back? Most creditors are prohibited immediately from any collect activities against you when you file for Chapter 13 bankruptcy. An Automatic Stay also prevents a car loan lender from repossessing your vehicle. Typically, you will be able to keep your car when you file Chapter 13 bankruptcy protection. Car payments that you are behind on may be made up through the Chapter 13 payment plan to avoid repossession. Also, if you owe more than the car is worth, you may be able to reduce the value of the loan to the current replacement value of the car. The automatic stay, prohibiting creditors from taking collection efforts against you, also prevents your car lender from repossessing your car. Essentially, the automatic stay will protect you in several situations: if the lender has already repossessed your car, or if the has not yet (but would/will) repossess your vehicle. When you file for bankruptcy, no repossession action can be taken. If your repayment plan in the Chapter 13 bankruptcy deals with the back payments on the car loan, the lender may not repossess your vehicle during or after the bankruptcy. You must stay current on your payments through this plan/agreement, however. The payments are designed to cover the depreciation of the car during the time in which the payments are made. Once you file for bankruptcy, you must make your payments until your plan is confirmed. If your car has been repossessed, contact our Arizona Bankruptcy Law Firm immediately. Our experienced attorneys can help you get back your vehicle and help you to attain the automatic stay to stop creditors from collection actions. If your car was repossessed before you file for bankruptcy, you may be able to get the car back if the arrangements for payments are provided in the repayment plan per the Chapter 13 bankruptcy (assuming you continue making the monthly payments). Our Mesa Arizona Bankruptcy Law Firm Helps clients in Arizona Seek a resolution to their financial problems. If you are facing creditor harassment, financial crisis, repossession, or other financial challenges and problems caused by the loss of a job, injury, sudden death or injury, or if you are a victim of a failing economy, it is time to take action and protect your rights under the Arizona federal bankruptcy protection. Our Arizona Bankruptcy Law Firm and experienced Arizona Bankruptcy attorneys have been helping clients in Arizona achieve their debt relief goals, end harassing contact by creditors, stop foreclosures, and prevent repossessions. 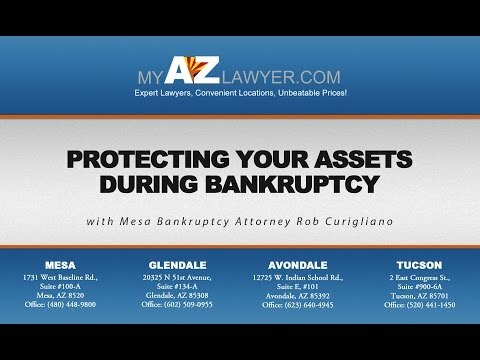 Our attorneys would like to discuss your unique financial situation and use our experience with the Arizona bankruptcy courts to use the powers and legal protection of Chapter 7 and 13 bankruptcies in order to give you the solutions, options, and support you need in order to achieve financial freedom. Bankruptcy is not a punishment. Bankruptcy is a means in order to take that first step to improve your financial issues. It could be your chance for self-improvement and a second chance at financial success. Losing your car can have a great impact on your life: it can completely disrupt your entire lifestyle — getting to work, taking your kids to school…. it is important property that you may not be able to live without. Our established, professional Mesa bankruptcy lawyers have the knowledge of dealing with financial issues such as vehicle repossessions. Hiring a Lawyer after an Avondale Vehicle Accident?